by Luis I Gordillo. Oxford and Portland Oregon: Hart Publishing, 2012. 410pp. Cloth $124/ £62. ISBN: 978-1-84946-221-1. Reviewed by Guilherme Vasconcelos Vilaça, School of Political Science and International Studies, University of Queensland. Interlocking Constitutions is a recent addition to the already voluminous scholarship on the fragmentation of international law. The book advances two claims: one descriptive and one normative. Descriptively, the author, Luis Gordillo, shows how legal certainty and the protection of fundamental rights are eroded by the current situation in which overlapping but non-supreme legal orders and organs (European Court of Justice, European Court of Human Rights, United Nations Security Council and domestic constitutional courts) make all sorts of constitutional claims. He names this state of affairs “interordinal instability”. According to Gordillo, overcoming legal fragmentation, from the European legal order point of view, requires fresh institutional design. Praising the prudence that judicial bodies and legal scholarship have displayed so far, he instead blames political actors for the current fragmentation. Accordingly, he suggests that political agency is imperative to resolve conflicts between different legal systems. More specifically, he advocates for the accession of the European Union to the European Convention on Human Rights and the establishment of judicial review of sanctions imposed by the United Nations Security Council. However, the central (normative) claim of the thesis is far more ambitious. 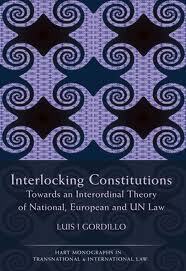 Indeed, Gordillo argues that solving the fragmentation of international law and creating a lasting interlock of legal orders requires a soft constitutionalist approach that navigates between the Scylla of pluralism and the Charybdis of hard constitutionalism. He uses the famous Kadi case, concerning the legality of a Council of the European Union regulation pursuant to resolutions of the United Nations Security Council authorizing the freezing of assets of suspected terrorists, to show how the European Court of Justice’s exclusive reliance on European legal materials (i) gives incentives to all other constitutional orders to act in a similar protectionist vein thereby endangering constitutional dialogue; and, (ii) weakens the role of Europe as a “regulatory, civil or ethical power” (p.307). Interlocking Constitutions is a ponderous book that documents exhaustively, from a doctrinal and case law standpoint, the degree of fragmentation in the relations between the European legal order(s) and the international one represented by the United Nations. At the same time, this description is not particularly new and will only be of interest for those readers wishing to have a comprehensive [*350] picture, particularly with regard to the historical details, of such legal fragmentation. Unfortunately, the articulation of the book’s normative thesis, i.e. soft constitutionalism as the most adequate model to address interordinal constitutionalism, is rather unconvincing. This is because the author neither elaborates on the normative aspects of the theory of interordinal constitutionalism nor engages properly in normative reasoning. Since the descriptive claim, albeit solid, is fairly standard, the shortcomings of the normative argument effectively limit the contribution the book makes to existing scholarship on the fragmentation of international law. I will return to a discussion of the normative claim after discussing the descriptive claim in more detail. Part I examines the claims and counter-claims of supremacy and primacy between the European Court of Justice and select Member States’ constitutional courts. Whereas the story is well-known in general (Sweet 2000), Gordillo also examines the less popular Spanish and Polish experiences. Part II focuses on the relations between EU law and the European Convention on Human Rights mapping in detail the interordinal instability that the Bosphorus type of case law creates i.e. a dual standard of protection of fundamental rights within the European legal space. In turn, Part III extends the discussion to the relations between EU law and the law of the United Nations examining the different reactions of the European Court of Justice and the European Court of Human Rights to United Nations law and Security Council resolutions. Here, Gordillo focuses on the Kadi, and Behrami and Saramati cases. For Gordillo, all these interordinal relations and judicial dialogues revolve around fundamental rights. Thus, it is hardly surprising that his proposals of (i) accession of the European Union to the European Convention on Human Rights; and, (ii) judicial review of the United Nations Security Council resolutions, have as the main goal the establishment of a uniform minimum level of rights protection. In what constitutes its main strength, Interlocking Constitutions offers the most detailed legal doctrinal and jurisprudential account available concerning the problem of fragmentation of international law from a European perspective. In other words, this is not a book on conceptual (Prost 2012) or general legal fragmentation (Berman 2012) but on how European legal fragmentation took place; how it has been managed and how it can manage international law to maintain the level of protection ensured by European domestic and community laws. While none of the three parts summarized above is innovative per se, together they offer a thick and comprehensive picture that mixes the problem of legal fragmentation with the process of European integration and affirmation premised upon the protection of fundamental rights. However and precisely because most materials are not innovative per se, Parts I to III could have been considerably shortened. Very often, the presentation of the argument takes a very scholastic form starting with textbook-style explanations of the elements under analysis to the point that it is difficult for the reader to keep track of the line of reasoning. For example, it is difficult to justify the thirty pages spent solely on [*351] the “The Fundamental Rights and the Union” (Part II, Chapter 3, pp.59-97) or the twenty pages on functional succession, accession and the legal value of the European Convention on Human Rights in the Intergovernmental Pillars (Part II, Chapter 4, pp.98-121). This is particularly problematic for the clarity of the argument because often these long descriptions are not capitalized on or necessary to the claims advanced later in the book. Along the same lines, it is also unclear the role that Part I, on the “supremacy” and “direct effect” saga involving the European Court of Justice and domestic constitutional courts, fulfills in the argumentative structure of the book. Hence, the book suffers from an unresolved identity crisis – textbook/treatise in EU law or argumentative exercise on fragmentation of international law – that considerably affects its effectiveness and readability. The book’s least successful aspect, however, concerns the normative claim. To be fair, I have to explain why I assume this particular claim to be so important. First, and as mentioned before, the descriptive picture albeit comprehensive is hardly novel. Secondly, Gordillo himself makes clear that soft constitutionalism is a distinctive and central contribution of his book to address legal fragmentation (p.8). In this respect, it is clearly an ambitious attempt to carve a third way between pluralism and constitutionalism. In other words, the book’s appeal and success, as portrayed by the author and when inserted in the existing literature, crucially depends on the quality of the normative claim. The first puzzling thing regarding the normative claim is that it occupies only the last thirty pages of the book. While this may be due to differences in the style of academic writing (being a Southern European educated lawyer myself I am aware of the problematic tendency to leave central claims to the end) it also reveals how the book overlooks the argument in which most work was needed. But how? (iv) Why would we accept that the “whole system” will navigate “to a kind of synchronization of the standards of protection of fundamental rights” (p.307), and that this is the most desirable state of affairs? Assuming the former would require either unshakable faith in progress and in rights discourse as the pinnacle of progress or the help of an evolutionary argument similar to Kant’s argument that “perpetual peace is guaranteed by no less an authority than the great artist Nature itself” (Kant 1991, p.108). Assuming the latter implies believing that rights discourse is the most appropriate means of social ordering and that it automatically solves actual social problems. In other words, there is no solid examination of the reasons behind the proclaimed normative superiority of soft constitutionalism, rights discourse and its reliance on an interpretation of history as geared towards progress. Of course, one could think that Gordillo did not write a book on political theory and philosophy, and therefore should not be judged for not having written the book I envisioned instead. In addition, it is also true that Gordillo argues that the soft constitutional model is superior to the stance that the European Court of Justice took in Kadi, e.g. a stance that denied any constructive dialogue with international law since the European Court of Justice declared the autonomy of the European legal order based on EU law only. Furthermore, Gordillo suggests that this insensitive dismissal of international law puts the European Court of Justice and the US Supreme Court much closer than before. This is undesirable, according to the author, because it jeopardizes future constitutional dialogue across legal orders and goes against “‘the model of good international citizen’ that it [EU] always wanted to be” (p.317). I find it difficult to evaluate this argumentative move. First, it has little to do with the soft constitutional project as defined in the quote above. Rather, it appears as simple political pragmatism. Second, it does not do away with the thorny questions. Given EU’s traditional legitimacy gap, why should the European Court of Justice engage in a constitutional dialogue with different legal orders at the expense of the EU citizens’ project based on the protection of fundamental rights? In addition, it is also only normal that the European Court of Justice did not engage in a sort of Solange test, i.e. refraining from exercising its jurisdiction as long as the [*353] level of rights protection is equivalent across the legal orders at stake. Here, it is clear that the Solange test is only intelligible within a similar community (the European comprising both EU and domestic legal orders). Therefore, Gordillo’s appeal to Solange as a more constructive example of judicial dialogue forgets that at stake are two sets of relationships: each one involving communities exhibiting very different levels and patterns of integration among themselves: EU/Member States and EU/International Order. The bottom line is that one cannot really do away with the question “which community?” when engaging in normative analysis on interordinal constitutionalism. At the same time, however, this acknowledgement forces us, at least, to re-question a “one size fits all” model of constitutional dialogue. Finally, Gordillo’s argumentative move does not explain why one should privilege dialogue over agonistic politics. In other words, there are no arguments in the book that displace the traditional objections to global constitutionalism: that politics is always local (Koskenniemi 2005). The book’s attempt to engage in normative reasoning connected to empirical legal doctrinal analysis is laudable but one has the feeling that the real book, the one that was announced and could offer an important contribution to the fragmentation debate, only starts on page 287 and ends on page 317. Unfortunately, that proved manifestly insufficient to engage in solid and rigorous normative reasoning. As such, the final message is shaky: in times of interordinal constitutionalism, let us engage in soft constitutionalism, but for reasons we are not fully given. Anscombe, G. E. M. 1958. "Modern Moral Philosophy." Philosophy 33: 1-19.
de Búrca, Gráinne. 2010. "The European Court of Justice and the International Legal Order after Kadi." Harvard International Law Journal 51 (1): 1-49. Berman, Paul Schiff. 2012. Global Legal Pluralism: A Jurisprudence of Law Beyond Borders. Cambridge, New York: Cambridge University Press. Cotterrell, Roger. 2012. "What Is Transnational Law?" Law & Social Inquiry 37 (2): 500-24. Kant, Immanuel. 1991. "Toward Perpetual Peace: A Philosophical Sketch." In Toward Perpetual Peace and Other Writings on Politics, Peace, and History, ed. Pauline Kleingeld. New Haven, London: Yale University Press. Pp.67-109. Mouffe, Chantal. 2005. On the Political. New York: Routledge. Prost, Mario. 2012. The Concept of [*354] Unity in Public International Law. Oxford, Portland: Hart Publishing. Sweet, Alec Stone. 2000. Governing with Judges: Constitutional Politics in Europe. New York: Oxford University Press. P Kadi and Al Barakaat International Foundation v. Council and Commission, Case C–402/05 P and C–415/05  ECR I–6351. Behrami v France; Saramati v France (dec.), nos. 71412/01 and 78166/ 01, Eur. Ct. H.R. 2007. Copyright 2013 by the Author, Guilherme Vasconcelos Vilaça. ACKNOWLEDGEMENTS: I would like to thank Marina Lostal Becerril and Rachel Lee for comments on the style of the paper. All errors remain mine.